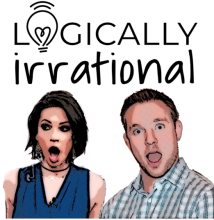 YEA Networks, the parent company of "The Kidd Kraddick Morning Show," is producing and distributing "Logically Irrational," a weekly podcast from Melissa Rycroft-Strickland and husband Tye Strickland. "Logically Irrational" delves into relationships, family, pop culture and Reality TV. Melissa Rycroft began her career in the spotlight as a Dallas Cowboys cheerleader before appearing on ABC's "The Bachelor" and "Dancing with the Stars" and then marrying her husband Tye Strickland. In addition to appearing with Melissa on the CMT reality show "Melissa & Tye," Strickland runs his own insurance agency in Dallas. "We are so excited to get the opportunity to work together and merge our worlds: his being a serious businessman, and mine being a carefree television personality," said Rycroft-Strickland. "We're taking the conversations we have at night, after the kids have gone to bed, and we're watching t.v. together, and sharing those with everyone." George Laughlin, CEO of YEA Networks added, "Not all couples have chemistry on the mic, but Melissa and Tye definitely have IT. We're excited to welcome them to the YEA Networks family and look forward to helping them rise up the podcast charts."